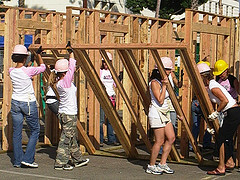 Los Angeles, CA – June 4, 2014: Habitat for Humanity of Greater Los Angeles’ (Habitat LA) Power Women Power Tools (PWPT) build event turns ten this year and more than 200 volunteers are expected to join in the celebration. The all-women crew of volunteers will be framing walls for four new sustainable, affordable homes in Lynwood, as part of a seven-home neighborhood currently in progress. Habitat LA is pleased to welcome back Lowe’s, Union Bank and Sony Pictures Entertainment as the primary supporters of this event. Power Women Power Tools attracts hundreds of professional women from various sectors, including corporate, entertainment, education and faith to build homes side by side with Habitat LA partner homeowners. Los Angeles, CA – May 21 2013: Habitat for Humanity of Greater Los Angeles’ (HFH GLA) highly anticipated “Power Women Power Tools” (PWPT) build returns to Sony Pictures Studios on Saturday, June 15, 2013. More than two hundred volunteers will participate. The volunteers will be framing walls, which will be used for future construction of decent, sustainable and affordable homes in the local community. HFH GLA is also pleased to welcome back Lowe’s, Sony Pictures Entertainment and Union Bank as sponsors of this year’s event. PWPT, now in its ninth year, attracts hundreds of professional women from various sectors, including corporate, entertainment, education and faith to build homes side by side. Los Angeles, CA – October 10, 2012: At a time while most Angelenos were sweating the closure of the 405 freeway, more than 500 volunteers were sweating for a cause framing eight new Habitat for Humanity homes. For the second consecutive year, Lowe’s sponsored Power Women Power Tools and the Hollywood for Habitat for Humanity Build-A-Thon. Celebrities, entertainment industry and corporate executives volunteered their time at Sony Pictures Studios on Saturday, Sept. 29 and Sunday, Sept. 30 to help Habitat for Humanity of Greater Los Angeles (HFH GLA) frame walls for eight affordable and sustainable homes as part of the Hollywood for Habitat for Humanity (HFHFH) program. Los Angeles, CA – August 6, 2012: Habitat for Humanity of Greater Los Angeles announced today Lowe’s will return as the “Diamond Hammer” (title corporate partner) of its premier build events, Power Women Power Tools (PWPT) and the Hollywood for Habitat for Humanity Build-A-Thon (HFHFH BAT). More than 500 volunteers will participate in the events at Sony Pictures Studios in Culver City on Saturday, Sept. 29 and Sunday, Sept. 30. The volunteers will build walls, which will be used for future home construction in the local community. Lowe’s became the title corporate partner for the events in 2011 and since then has committed more than $500,000 to revitalize communities throughout greater Los Angeles.